HARARE, ZIMBABWE,VARIOUS OF RETIRED ARMY GENERAL SOLOMON MUJURU SEATED WITH WIFE VICE PRESIDENT JOYCE MUJURU BEATRICE, DIES IN HOUSE FIRE. A retired Zimbabwean army general and key figure in internal battles over President Robert Mugabe's succession in his ZANU-PF party has died in a fire at his farmhouse, government officials said on Tuesday (August 16). General Solomon Mujuru, 67, popularly known by his guerrilla name Rex Nhongo, was married to Vice-President Joice Mujuru, and was deputy head of Mugabe's liberation army ZANLA in the 1970s. 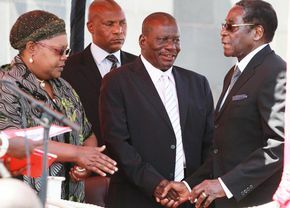 Mujuru headed a ZANU-PF faction which wanted Joice Mujuru to eventually succeed Mugabe as party and state president, jostling against another faction headed by Defence Minister Emmerson Mnangagwa. He died on Monday night at one of his commercial farms in Beatrice, 60 km (40 miles) south of the capital Harare, when his house caught fire, and the roof collapsed before he could escape. National State Security Minister Sydney Sekeramayi said Mujuru was burnt beyond recognition, and police were investigating the cause of the fire. "Unfortunately our celebrated Rex Nhongo is no more, and it is difficult for us all to accept this tragic fact and the tragic circumstances of his demise," he told Zimbabwe state television ZTV. Television pictures showed a gutted home, and dozens of shocked ZANU-PF officials at the farm. Mujuru's charred body was found in a small room in the farmhouse where he had probably sought refuge, Sekeramayi told state tv. Officials said the general's vice president wife was not at the farmhouse, and was called to the scene early on Tuesday. There was no suggestion either by authorities, or Mujuru's family that the fire was anything but an accident. Mujuru became Zimbabwe's first black military commander after independence in 1980, after serving for a few months under Rhodesia's last white general Peter Walls, retiring 1992 to take up a post in ZANU-PF's top organ, the politburo. Mujuru, who helped Mugabe consolidate power as leader of ZANU-PF in the 1970s, was a quiet backroom political player nicknamed "kingmaker" by his admirers - a reputation that was bolstered when he persuaded Mugabe to back his wife Joice as one of the party vice presidents at a 2004 ZANU-PF congress. Political analysts say Mugabe, 87, is likely to have a big say on who succeeds him if and when he decides to step down and both factions publicly pledge allegiance to him. The veteran Zimbabwean leader, in power since 1980, is still officially ZANU-PF's candidate for presidential elections likely to be held in the next two years. Mugabe was forced to form a unity government with main rival Prime Minister Morgan Tsvangirai of the Movement for Democratic Change (MDC) after disputed elections in 2008. The fragile ZANU-PF/MDC coalition is haggling over democratic reforms, including a new constitution, before the next elections.